Surprise Tatra participant is Albert Llovera. By the end of 2015 it became clear that Bonver’s third driver, Polish racer Robert Szustkowski, has to cancel his participation for the 2016 Dakar due to health problems. For Tomas Vratny, team chief of the Bonver-Tatra Team a challenge to find a new driver as soon as possible. “It’s incredible what we have succeeded in a few days. The fact that Robert is not going to Dakar, we learned about early November. Immediately, we started looking for another solution and we addressed a number of Czech and foreign potential drivers from whom we have received interesting offers. One of them, however, was exceptional, and it was an offer from a the handicapped Andorran Albert Llovera, “said team boss Thomas Vratny. Despite this handicap, however, Llovera participated in rallies and in the years 2007, 2014 and 2015 have also tried the Dakar Rally in the car category. The new pilot Bonver Dakar Project Team, which will participate in the Dakar Rally 2016 is Albert Llovera. Handicapped Andorran racer will drive a specially adapted truck Tatra. The Llovera truck will be operated only via levers and handles on the steering wheel. A similar system competed in the Dakar Rally in 1988, former Formula 1 driver Clay Regazzoni driving a Tatra also. To adapt the Tatra to the needs of Llovera raised headaches, but one succeeded. “It was a crazy week of phone calls, meetings, sketches of the car and a lot of mileage. Finally we succeeded, thanks to the effort of many people. I would like to thank my new navigator Charlymu Gotlib, Team Dakar Bonver Project and Company Guidosimplex. In five days we managed to adjust the truck, which is incredible, “he praised Albert Llovera efforts of all involved. The Dakar Rally 2016, the Andorran racer will present together with navigator Charly Gotlib, multiple participant and winner of the Dakar Rally truck category in 2007. The position of mechanic is trusted to Jaromir Martinec, also multiple participant in the toughest rally of the world, who raced with Tomas Tomecek and Andre de Azevedo. Currently, after stage 5 of the 2016 Dakar, Llovera is 40th overall, 21 hrs behind the overall leader. The two other Bover Tatra trucks are 20th and 21th overall, 16 hours behind the overall leader. Albert Llovera Massana (born 11 September 1966) is a rally driver and former alpine skier from Andorra. He became the youngest athlete to compete in the Winter Olympics in 1984 at the age of 17. A serious accident in 1985 left him paralysed from the waist down. He has since taken up rallying, using cars with specially adapted hand controls. He is currently competing in the Super 2000 World Rally Championship.At the age of 17, Llovera became the youngest ever athlete to compete in the Winter Olympics when he represented Andorra at the 1984 games in Sarejevo, Yugoslavia. In the following year, 1985, whilst competing in the European Ski Cup, also in Sarejevo, he suffered a serious accident which left him using a wheelchair with paraplegia beginning at lower back level. He turned to motorsport, first competing on quad bikes and then starting in rallying. In 1989 he won the Peugeot Rally Cup in Andorra. In 2001, with the support of Fiat, he began competing in the Junior World Rally Championship in a Fiat Punto S1600. He continued in the championship in 2002. After competing in Spain along with selected WRC appearances he returned full-time to the world stage in 2010 to contest the Super 2000 World Rally Championship in a Fiat Abarth Grande Punto S2000. He finished fifth in class on his first event Rally Mexico. He scored a best overall result of 17th on Rally Catalunya, which was not a round of the SWRC. He continued in the SWRC in 2011, finishing fourth in the category in Jordan. The new pilot Bonver Dakar Project Team, which will participate in the Dakar Rally 2016 is Albert Llovera. 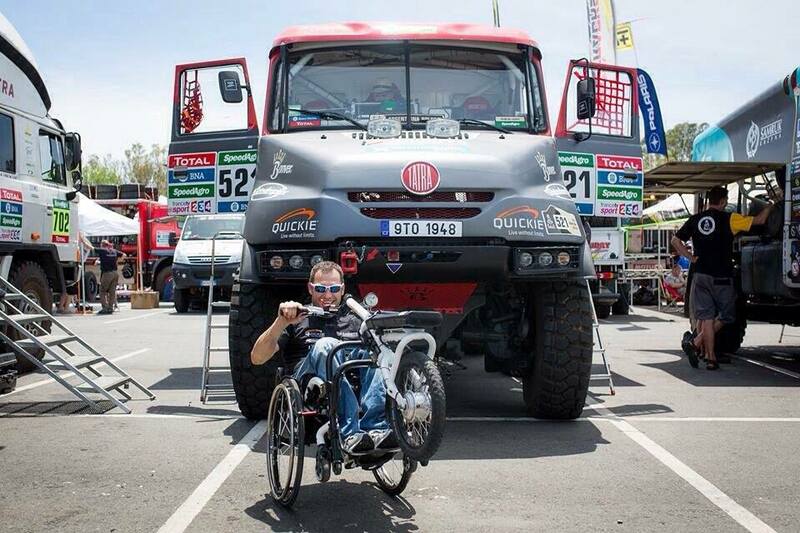 Handicapped Andorran racer will drive a specially adapted truck Tatra. The truck had originally governed the Polish racer Robert Szustkowski, but due to health problems their participation in the famous Dakar Rally canceled, so he had to team boss Bonver Dakar Project Thomas Porter to find a third special racing other equestrian cast. “It’s incredible what we have succeeded in a few days. The fact that Robert is not going to Dakar, we learned about two weeks ago. Immediately, we started looking for another solution and we addressed a number of Czech and foreign potential clients from whom we have received interesting offers. One of them, however, was exceptional, and it was an offer from a competitor hendikepovaného Andorran Albert Llovera, “said team boss Thomas Porter to name his new team-mate did not communicate even at a press conference organized before leaving for Dakar 2016. The biggest challenge for the team Bonver Dakar Project’s actual participation of Albert Llovera on the Dakar Rally. The Andorran experienced racer since he was eighteen years old when he suffered an injury during the race in downhill skiing, paralyzed from the waist down and permanently confined to a wheelchair. Despite this handicap, however, participate in rallies and in the years 2007, 2014 and 2015 have also tried the Dakar Rally in the car category. “It was a crazy week of phone calls, meetings, sketches of the car and a lot of mileage. Finally we succeeded, thanks to the effort of many people. I would like to thank my new navigator Charlymu Gotlib, Team Dakar Bonver Project and Company Guidosimplex. During the five days we managed to adjust the car so I could drive it, which is incredible, “he praised Albert Llovera efforts of all involved. The Dakar Rally 2016, the Andorran racer will present together with velezkušeným navigator Charlym Gotlib, šestadvacetinásobným participant and winner of the Dakar Rally truck category in 2007. The position of flight engineer is complete Jaromir Martinec, also multiple participant toughest rally of the world, who raced with Tomas Tomecek and Andre de Azevedo. This international racing crew, Bonver Dakar Project will participate in the Dakar Rally in 2016 with a truck Tatra Jamal modified control system. Llovera truck will be operated only via levers and handles on the steering wheel. A similar system competed in the Dakar Rally in 1988, a former Formula 1 driver Clay Regazzoni, who also drove a truck Tatra. “I start from this new adventure very happy. Once again I would like to thank all those who took part in this project and supported me. I would also like to thank my family that after a month ago my father died, pull together more than ever. Especially my daughter, Cristina, who must train away from us and that continues to fascinate me. Getting started this adventure together, and I’m glad to have you by my side, “said Albert Llovera.